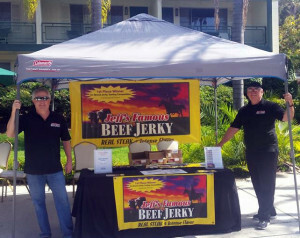 Start your own beef jerky business selling at local events. Selling Jeff’s Famous jerky is more than just a side business. It’s absolutely an opportunity to have a ton of fun meeting lots of interesting people while making money. It can be a great family bonding experience too. Imagine the great lessons about business and selling you could teach your kids, while offering a product that nearly everyone absolutely LOVES. Most of our event vendors work part time and there is opportunity in every state and every city in almost every month of the year. And people of all ages love selling our product. If you have tried our jerky you know that few others compare. Imagine the joy you will bring to others the first time they try it… they are going to want MORE. Whether you have part time or full-time availability, you can start your own Jeff’s Famous jerky business with significantly less start-up funds than you can start up other businesses and you have the flexibility of scheduling only the events you want, when you want. Need some coaching to help you find your success in this business? Just give us a call. Personal service to support you that is second to none. Beef jerky is no longer just a man’s snack. The healthy attributes and softer more flavorful texture and healthier attributes of beef jerky that Jeff’s Famous produces is paving the way for a large growing segment of women and children who are representing a fast-growing segment of excited jerky consumers. Most customers who buy jerky at events, tend to buy multiple bags. Gourmet beef jerky is one of the fastest growing segments of the snack food industry and tons of opportunity is available. 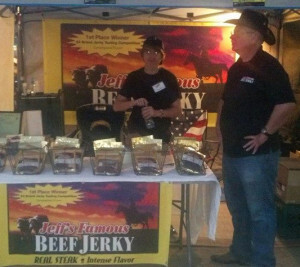 Jeff’s Famous jerky has lots of fun-loving part timers who sell their jerky at events. It is a great way to earn and a great opportunity to include your whole family and teach your children about responsibility and selling and serving the public. What type of events are perfect for selling Jeff’s Famous Jerky? Opportunity abounds. You don’t need a ton of money or time to get started. Let’s do it! Here is a quick overview of what you will need. Contact us to coach you through the process or to answer any questions. Business License: Check to see if a business license is required to get started. Unsure who to call? Your local chamber of commerce is usually a wealth of information. Health Permit: Most counties require a health permit to sample and sell jerky at events. Health permits for selling food typically are available by event and for the year by the county. Outdoor Selling: Most event opportunities are outdoor, and typically the space allowed is 10 ft. x 10 ft. You will need a 10 ft. x 10 ft. canopy. Typically, these can be purchased a great price of under $100 from a large retailer such as Wal Mart or Target. 2) Jeff’s Famous banners… contact us for information and pricing and allow a two-week lead time. 3) One to two 6-foot portable tables (Wal Mart is a good source). 6) Laminated flavor tags for each flavor to affix to the baskets. You order from the same place as banners… not expensive. This helps your customers to identify the flavors faster and that helps you to sell more product faster. You might want to put your flavor names on each side of the baskets to help you identify the flavors from the back too. 7) Solid color table cloth for your tables. Fitted table covers are another fine option. 8) Boxes of jerky or any food item generally needs to be 6 inches off the ground in storage to meet the health department requirements, so this can be on your second table or you can easily put something together for this such as resting a board on top of two plastic crates. 9) Weights of some kind to attach to the legs of your canopy for wind issues. Some people attach actual weights with bungee cords or make their own concrete buckets to attach to each leg with removable rope or bungee cords. 10) Extra bungee cords to put up banners, etc. 11) Capture all the potential sales by accepting credit cards for payment. That can be done easily with a Smart Phone and the Square or another option such as Paypal. 12) Laminated Sign with your prices posted that can be easily ready by anyone visiting your booth. 13) A chair inside your booth for anyone working the booth… although most of the time you will be standing and conversing with your new-found friends who will be eager to try the product. 14) In addition, your local health department may request you have access to a hand washing station and what is need to wash and sanitize any utensils you use, plus disposable sanitized towels. Discuss this requirement with us and we will help detail what you will need. 15) We suggest that you take credit cards too when you vend. You can easily set up an account here: https://squareup.com/us/en and request a free card reader that you can use on any smart phone to take credit cards anywhere you have an internet connection on your phone. As another option, if you have a Paypal business account, you can get their free card reader too. Once you contact us, we will usually contact you back within 24 hours with a personal email that outlines your special wholesale pricing, minimum orders and all the information you will need to make an educated decision to get started. A representative will be available to answer all of your questions and coach you toward getting started and finding your success. 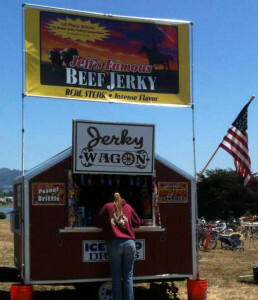 Take your time and project out a budget for everything you will need to sell Jeff’s Famous jerky at your first event, including finding an event, getting permits, needed, etc. Once you place your first wholesale order, we will send you our Jeff’s Famous Jerky Sampling Guide that shows you step by step how to maximize your sales. Contact us today and let’s get started!